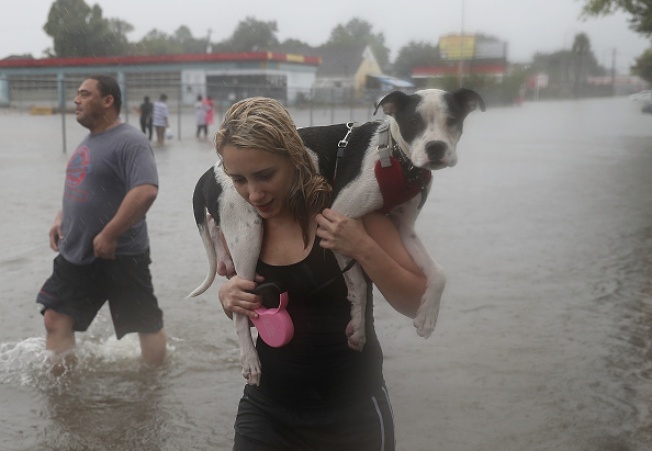 A Bay Area-based group is helping rescue shelter animals out of areas affected by floodwaters from Harvey, one of the largest downpours in United States history. Harvey late Friday spun into Texas as a Category 4 hurricane before parking itself over the Gulf Coast. It is blamed for at least three confirmed deaths. Emergency crews and volunteers are now out in full force to provide the area relief. A Livermore group, Wings of Rescue, is helping transport shelter animals out of Texas. The group announced in a Facebook post it was departing Louisiana to bring 88 dogs and 20 cats to San Diego. On Tuesday, the group planned to help transport 100 dogs to Oregon and Washington. The efforts continue Wednesday, with a plan to carry 100 dogs from San Antonio to New Jersey. All pets were in shelters prior to the storm, according to the group. Wings of Rescue is asking for monetary donations to help in their efforts. For every $10 donated, the group said it can fly 100 pets to safety. See below or view the group's Facebook post for more information on how to donate.